In the first episode, the rough shape of the story was sketched out (at least, the story as it appears initially…) and many of the characters of Game of Thrones were introduced, all at a pretty brisk pace that may have challenged those unfamiliar with the source material. In the second episode, more pieces of the puzzles are provided, in particular in terms of fleshing out the characters. The pacing is still quite brisk, though the scenes at least feel somewhat longer and give somewhat more room for revealing details about various relationships. One is definitely left with the sense that these characters had a life before the story began, though as this episode very clearly illustrates, many of them are now at a crossroad and the lives they used to have will soon change forever. 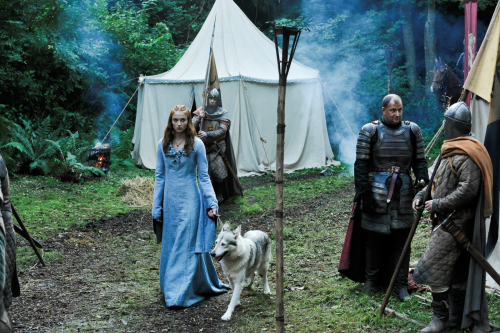 There are two scenes in Winterfell that are particularly poignant; one featuring Jon and Arya and one featuring Jon and Ned. Fans of the books should keep a very close eye on the scene between Jon and Ned, especially if they are familiar with a certain letter-based equation. Daenerys’s scenes from the first episode sparked a lot of debate and are likely to do so again. The story is, unfortunately, abbreviated through the loss of her interior monologues, but pay close attention when the eggs are shown, especially if you have not read the books and have some of that additional information in your head.